PhoulBallz.com: Is it time to be concerned about Mickey Moniak? Almost daily I am engaged via Twitter or email or text messages or in person about Phillies prospects. It comes with the gig. The player that scores the most inquiries is, as should be expected, 2016 top overall draft selection Mickey Moniak. For the most part I have responded in defense of Moniak and others, letting people know that the youngster’s skills are real and his coaches stand by them. I’d caution fans that he was young, still a teenager, among the five youngest position players in the Class A Advanced Florida State League (per his team the Clearwater Threshers, as of the end of April), and he just needed time to catch up to the older, more mature pitching at that level. Lately, though, I shrug and no longer think that concerns about Moniak's offensive numbers are unfounded. The lefty batting Moniak, through action on Saturday ranked fourth lowest in the FSL, among qualified batters, with a .495 OPS. He’s got just five extra base hits, all doubles, with 10 RBI and a .224 batting average in 39 games. Isaac Paredes, a Mexican shortstop prospect with the Tigers, who is still 19 years old until February next year, has a .704 OPS through 34 games. With seven doubles, a triple, four home runs and a .218 average, the righty hitter looks capable of handling the league. Braves outfield prospect, Cristian Pache, who is 19 years old until November sports a .738 OPS through 38 games. The righty batting Dominican sports a .289 average with nine doubles, three triples, a homer and 13 RBI. No problems for Pache, it seems. Dylan Carlson, a Cardinals outfield prospect, is a teen until October. He’s got a .617 OPS in 17 games to date since a promotion last month. The switch-hitter, who went 32 picks after Moniak in the 2016 draft, has two doubles a home run, nine RBI and a .200 average over 17 games in the same league that Moniak is playing in. That’s not too bad. Mets shortstop prospect Andres Gimenez, who will turn 20 in September, has a .746 OPS. The left-handed batter has seven doubles, three triples, two home runs, 13 RBI and a .262 average through 35 games. Overall, the Venezuelan is the best of the bunch. Also, by comparison, the Phillies’ 2015 first round pick (10th overall) Cornelius Randolph was a few weeks younger than Moniak is at the same level last year. On the same date a year ago, a younger Randolph had a better OPS by 106 points. However, even that .601 mark concerned some people. He's now in Double-A continuing to work and battle tough, older pitchers with a .550 OPS in 32 games. The previous, and only other, time the Phillies drafted in the top overall spot, was 1998 when they selected Pat Burrell. Burrell was a college third baseman, who made his MLB debut as a first baseman and ultimately made his home in left field. Burrell had a good career as a big leaguer, but he was never an All-Star. Based on that, by today’s demanding standards, if a number 1 overall pick never became an All-Star, then he turned out to be a bust. For Moniak, though, I'd bet with this type of worrisome start to his professional career, fans would be happy with Burrell-esque production. After all, he helped the Phillies win a World Series and notch four separate 30-homer seasons and blasted more than 250 round-trippers for the team. But Burrell was a taken out of college and was expected to be a power guy. Not quite that similar to Moniak, a high schooler with a much small frame that drew comparisons to Tony Gwynn or Ichiro Suzuki on the type of hitter he could become. Let's not forget, another first rounder that got a championship ring for being part of that 2008 championship club. Sure, I recall Chase Utley, who did some things and Jayson Werth who was a top pick with the Orioles. But how about another position player that was drafted in the first round? Who remembers Greg Golson? Golson, the Phillies' 1st round pick in 2004 (21st overall), played in just 40 big league games and, at the age of 32, is still playing independent pro ball. With a September birthday, Golson was roughly 9 months older than Moniak at the same Class A levels when he played there. He would tally a .295/.345/..410 slash line (Moniak comparison- .284/.340/.409 at same level) in 47 games with the Rookie level Gulf Coast League Phillies. Golson posted a .264/.322/.389 slash line in his season with Lakewood in 2005. The following season the righty hitter repeated Lakewood where he played 93 games, sported a .233/.277/.374 slash line (Moniak- .236/.284/.341 at same level) and moved up to Clearwater. Wrapping up his 2006 with .264/.324/.472 production (Moniak- .221/240/.255) over 40 Florida State League contests. Two years later, with 511 minor league games under his belt, Golson was a late season call up for the World Champion Phillies in the month he turned 23. So, after reviewing all of these statistical comparisons, is it time to worry about Moniak’s output? Sure, you can worry. You can sweat the possibility that Moniak, Randolph or some other recent Phillies high draft picks may not become the next Bryce Harper and might be headed toward Golson territory. You could live your life void of wishful sports vibes, convinced that a 20-year-old will never be able to live up to your sky high expectations. But maybe that’s not the best way to spend your energy or time. Perhaps be grateful and rave about the draft picks that are, or have the potential to, outperform their draft slot. Standout Phillies slugger Rhys Hoskins was a 5th round pick in 2014, taken 142nd overall. The number one overall pick that year, Brady Aiken, didn't even sign. It's a completely different kind of draft, but there's Phils center fielder Odubel Herrera, who was a Rule 5 draft pick, which means the Phils swiped him from another team's developmental system. He's been the best player on a team that's battling for top spot in their division and has reached base via hit or walk in 45 straight big league games. Back to the minors, specifically Clearwater, where a pair of later round picks, OF Austin Listi (17th round, 2017) and 1B Darick Hall (14th round, 2016) are currently teammates of Moniak and are on the opposite end of the league leaders board. They rank 2nd (.955) and 3rd (.922) in the FSL in OPS respectively. 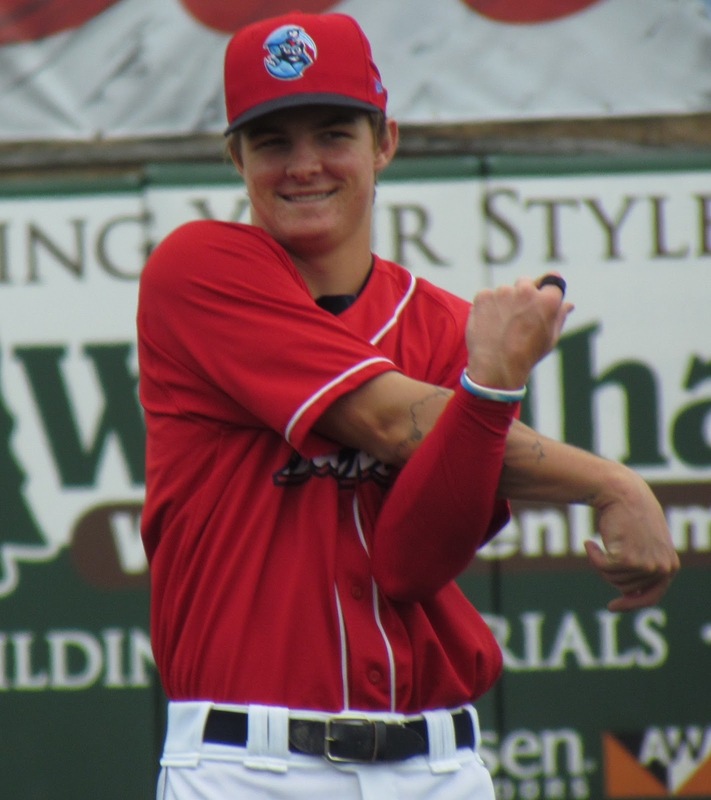 Also with Clearwater, the Phils' 31st round draft pick from 2015 Nick Fanti made his season debut this week after recovering from a back strain. He's the guy that tossed two no-hitters with Lakewood last season. Ultimately, it's up to you if you want to gripe and stress out over troublesome draft picks. But, even though you "just want people to be accountable", that's feeding the "Negadelphia" stereotype. Things are different now. You may have heard how the city's football team shook that vibe completely this year and allowed their long-starved fans to finally puff out their chests and boast about being the absolute best with pride. The baseball team is striving for the same turnaround and you won't be able to enjoy the run to Super Bowl Sunday if you can't get over Danny Watkins.